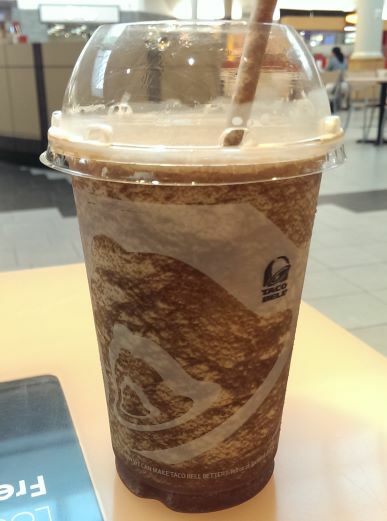 [New for 2014] First spied by an impulsive buy reader less then two weeks ago, the Taco Bell Freeze has already pushed the Mtn Dew Typhoon Freeze out of my local Massachusetts Taco Bell. Granted they have no signage up for it yet, but upon looking at the freeze machine, the brown substance was pretty obvious next to it's colorful brothers. 12 syllables... quite the mouthful, isn't it? I'll admit it, my negative side took over on the first sip. I wanted to compare it to a flat, watered down Dr. Pepper. The icy mix just wasn't the right complement for something that is basically supposed to taste like it's been mixed with ice cream. But I decided to wait, have a seat, and start eating my lunch. Sure enough, my positive side took over and I began to enjoy the new freeze. Alternating between small sips and my salty meal, everything started to balance out. I started enjoying the lingering Dr. Pepper aftertaste that I haven't experienced in years (I don't drink much soda nowadays). Rather then calling it watered down, let's call it mild and pleasant. It's more Dr. Pepper then vanilla float, but both are there. That said, this is also more freeze then it is Dr. Pepper, so keep that in mind as well (I know, probably stating the obvious there). I guess the point is, if this peaks your interest, go ahead a give a small size a shot. Note: The Kickstart black cherry freeze and the Baja Blast freeze are both still available. Forget about the freeze, something way more epic is going on here. DUBBA went to TACO BELL!!! And apparently you ate something! This makes the next Nosh Show must listen radio. AHAHAHAHAHA! Hey, I ate at Taco Bell once before, way back around episode 9 (for the respectable double steak quesadilla http://www.onsecondscoop.com/2013/07/the-nosh-show-episode-9-and-taco-bells.html). that said, technically I had a gift card to D'Angelos, so I used that for a steak & cheese and then bought the freeze to go with it. maybe next time! this is late, but I have to say.... every time I got to Tacobell, their freeze machine is broken. (it usually is the cherry kickstart) but today the dr pepper one was broken... so I have not been able to try this yet. boo to their crappy machines!!!! !